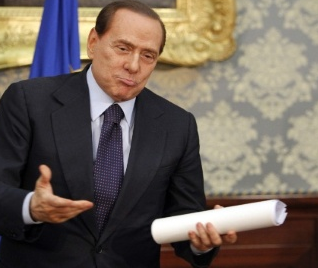 Silvio Berlusconi, Italy's Prime Minister displays an "Exaggerated Pout" during a news conference. Depending upon the other nonverbal signals with which it is clustered, a pout can be a signal of sadness - but when you see an exaggerated pout as Mr. Berlusconi shows us (without other expressions of sadness) - this is a signal is a body language way of saying, "Isn't it obvious?" or "This should be clear to everyone". Moreover it signals that there is a disparity of what is truly being felt and that which is expressed verbally. It is often seen in conjunction with the gesture cluster of a elevated eyebrows (and contracted forehead muscles) shoulder shrug and a palms-up display. Silvio's shoulders are elevated here and his palms-up gesture completes this cluster. Many confuse the exaggerated pout for a sign of sincere consideration. Don't make this mistake.